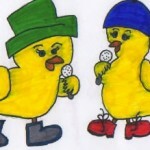 Chickens are People Too, is every Sat morning from 8-9 on WMPG 90.9 or stream live at WMPG.org. Chickens are People Too is a show geared for children approx 2-10ish years of age and People of all ages who are "kids at heart" . On-air we play a variety of music, have a variety of various themes and topics, tell a few jokes, dance,laugh, play, and have fun. A show that offers play, respect, and gives children a voice!